The St. Andrew Romanian Orthodox Church invites you to Revelion 2019. The event will be of great elegance, delicious food and quality music! 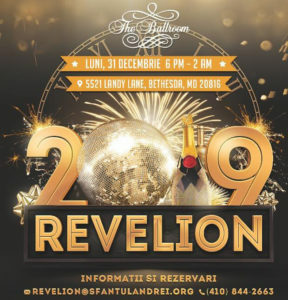 The event will take place at The Ballroom located at 5521 Landy Lane in Bethesda, Maryland. Doors will open from 6:00 pm. The menu includes as appetizers: a variety of cheeses and smoked pastrami; smoked salmon, prosciutto, spinach dip, humus dip, fish dip, spinach and artichoke salad, smoked turkey salad, pickled melons, cheese, corn mayonnaise, lettuce, olives, melons, capers, bell peppers with pesto sauce and marinated mushrooms. The main course includes: beef steak, pork loin, salmon with spinach and chicken with white sauce and mushrooms. Side dishes include: potatoes, asparagus and mushrooms. Live music with Larisa from Chicago and Maestro Victor Cibotari’s Band.